Dèesse Magazine: Champagne with your Buttercream ? Champagne with your Buttercream ? The Gals at Jaqua did it again. They just released new Liquid Hand Soap counterparts to their coveted Shower Syrups™ and Shower Crèmes (which are fab by the way!!!) in Pink Buttercream Frosting and Pink Champagne . These pink delights are loaded with fruit and plant extracts , along with Vitamins A,C,E & aloe. 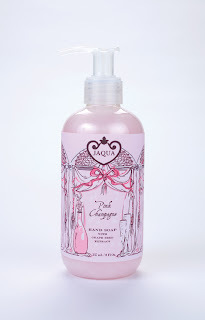 Both Pink Champagne and Pink Buttercream Frosting retail for $14.00 (8.5oz) , and can be purchased at www.jaquabeauty.com . Go on and pamper those hands!!!! they almost look too cute to use ! !